Welcome to Aspiring Heights Academy! Aspiring Heights Academy offers a low-cost private school umbrella option to Florida families choosing to educate their children at home. We serve students in grades K–12 and offer year-round enrollment. Our services include record keeping, FLVS enrollment, possible dual enrollment opportunities, diplomas, transcripts, assistance with Florida Bright Futures Scholarship applications, free student and educator identification cards, support, and more! Our school was established in 2010 under the name of iamhomeschooling.com in conformity with our informational website. As our school rapidly grew, we realized that it should have its own name, so in 2012 our school was renamed Aspiring Heights Academy. 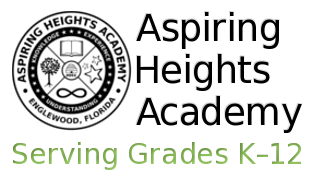 The name Aspiring Heights Academy was chosen because the word "aspire" means to seek to attain something high or great, which is something we all want for our children. In 2013, we moved our school here to its own website–aspiringheightsacademy.com. It is the mission of Aspiring Heights Academy to provide a covering to Florida families so that parents may educate their children concordant with their lifestyles and beliefs and in a manner that prepares their children to become self-directed, lifelong learners. We envision a stimulating and caring educational environment that encourages children to develop their full potential in accordance with their individual abilities and learning styles. Graduates of Aspiring Heights Academy will possess the knowledge and skills needed to prepare them for a variety of post-graduation options and enable them to excel in today's competitive world. We believe that race, religion, and economic income should not be a barrier to academic achievement. The Aspiring Heights Academy crest is both meaningful and symbolic. The outside ring contains the name of our school and the state under which our school has been registered. The inside ring contains 13 stars, one for each grade we serve, and the words Knowledge, Experience, and Understanding to define Wisdom. The inner circle includes an open book to symbolize lifelong learning; three stars of increasing size to represent our Elementary, Middle, and High School students; the infinity symbol to remind us that there is no limit to what one can learn; and a tree to symbolize the knowledge that can only be gained through real life experiences. The beehive and Roman numerals in the center represent our founding name and the year our school was established.